This post is inspired by Smiv’s reminiscences about cinnabar moth caterpillars when commenting on my previous blog entry. 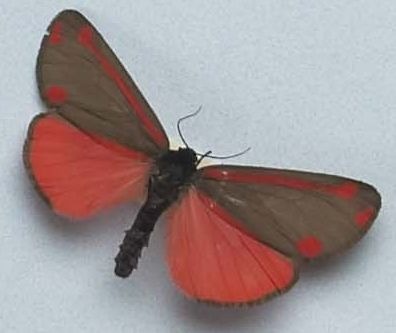 Also, as adult cinnabar moths are on the wing this time of year in New Zealand summer and sightings always generate a number of calls to Te Papa’s entomology department, I thought this species deserved a posting of its’ own. The cinnabar moth (Tyria jacobaeae) is part of the family Arctiidae (also known as tiger moths). With its distinctive red and black wings, the cinnabar moth is often and aptly described as striking. Its bold colours mean it is sometimes mistaken for a butterfly. Even the older caterpillars are strongly coloured with alternating yellow and black bands. These sharply contrasting colours are a warning to would-be predators that these insects taste bad because of the toxic alkaloids they’ve taken up while feeding on ragwort (Senecio jacobaea). A taste for ragwort is the very reason this moth was introduced from the UK to New Zealand. While ragwort’s toxins help protect the cinnabar moth’s caterpillars, they are a menace to livestock. Thus, it was hoped the cinnabar moth would help reduce the risk ragwort posed to stock. These moths were first imported into New Zealand from the UK in the 1920s. By 1932 cinnabar moths had been released over much of the country. Alas, the moth didn’t really prosper outside of central New Zealand and its value as a ragwort biological control agent in its own right is mixed. Thanks to re-establishment efforts in the 1980s the cinnabar moth is more widely established in NZ than it once was. While it may not win the fight against ragwort on its own, it still has a part to play when used with other ragwort control agents such as ragwort flea beetle and ragwort plume moth. I have seen 2 this week in the Omori/Pukawa area of Lake Taupo. In native bush/farm bush line. First time ever seen, and as reported, a small but vivid splash of red. Just found one in Gisborne, really striking, never seen one before. Just had one fly into the house tonight…we are just out of Cambridge. Have never seen one before in my 44 years. Funnily enough I sprayed all my weeds this morning…which includes ragwort…coincidence ? I spotted one of these this morning amongst weeds in the garden. We live in the Moutere, near Nelson. I have seen one once before a few years ago here as well…and some of their caterpillers. Don’t know whether to get rid of the weeds now! !